Whoa. Four months from now he and Barry are at the unknown grave. He says it’s not his fault it’s his responsibility. Who is in that damn grave? Oliver just wants to go 1st season to find Darhk before he disappears in the wind. In flashback world on Lian Yu, He gets caught and whipped until those weird symbols Constantine put on him, start glowing. I still really have no idea what’s going on in the flashback, but it caught my interest this episode. Felicity is going into surgery. Oliver is not there. She’s making excuses for him, but she knows him so well, that’s why. Lance (Paul Blackthorne) gives up Darhk. Oliver goes there but Anarky (Alexander Calvert) got there first. Laurel finds out about the new stepmommy. Surprise! I’m so glad she stopped being judgy. I like her so much better now. They go to Machin’s home, but he was expecting Darhk, not them. He does seem to be sporting a big crush on Speedy, because she burned him? That’s weird. Then they have a twisty heart to heart. 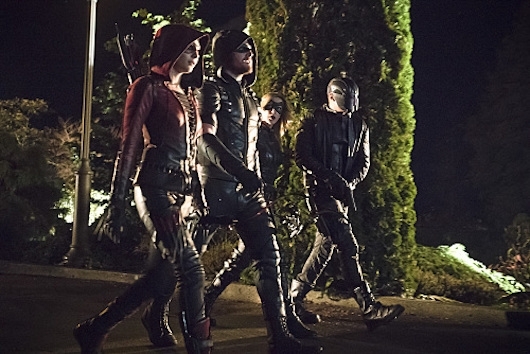 They bring him back for some torture, but Oliver has to run. Something is wrong with Felicity. She will never walk again. This spurs Oliver to point the smoking gun that is Anarky at Darhk. Anarky is kinda cute and charming. Diggle beats on his brother to get info. It is only when he pleads to his humanity that he gets something. That and a deck of cards. Machin finds Darhk’s wife and daughter. Oh man. This is not going to go well for Anarky. Machin: “First you catch me. Then you break me out. Then you want to catch me again. Make up your mind!” The mouthy villains are always the most fun. Darhk appears. He and Oliver have a brief fight. When Darhk demands his family, he tells him he saved them. So Darhk gives him brief mercy. Speedy can’t kill Anarky, then he shows mercy too. Everyone’s gones soft this episode. Except Darhk’s wife. She is more vicious than her husband. She thought he should have killed The Green Arrow even though he saved them. OK. It’s not Felicity who’s dead. Who then, who? Good, good, good episode, especially with the comic snark of Anarky. See? A show can be as dark as Arrow, and funny. Calvert made a good show, so much better. It doesn’t have to be super comic-y like The Flash or like Legends of Tomorrow promises to be, but can have the jokes amidst the darkness like Constantine. THE AFTERMATH — Oliver (Stephen Amell) must deal with the devastating consequences of Darhk’s (guest star Neal McDonough) last attack. 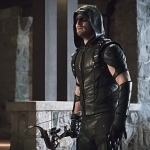 Seeking revenge, Oliver goes on a brutal manhunt looking for Dahrk. Jesse Warn directed the episode written by Oscar Balderrama & Sarah Tarkoff (#410). Original airdate 1/20/2016.